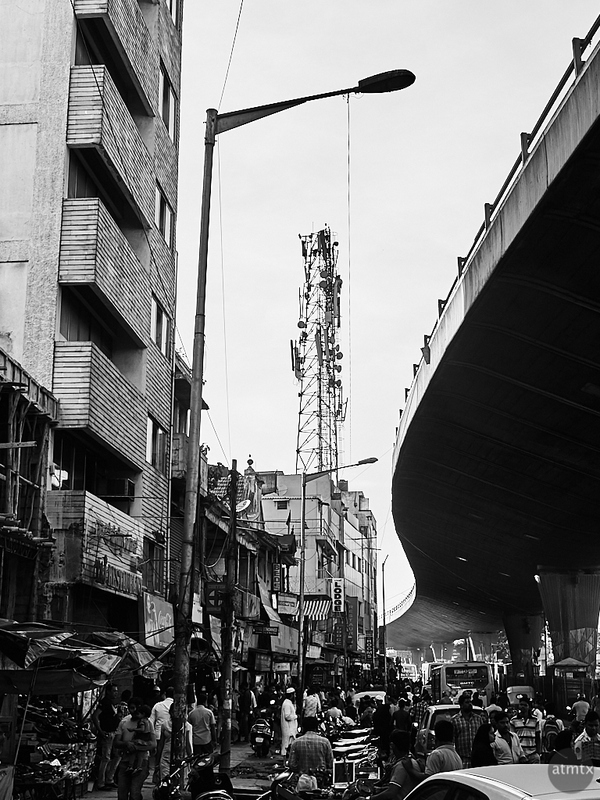 I’m going back to my roots to showcase urban landscapes for today’s post. Though, unlike my old work using wide-angle and HDR, I’m using a classic street photography aesthetic. 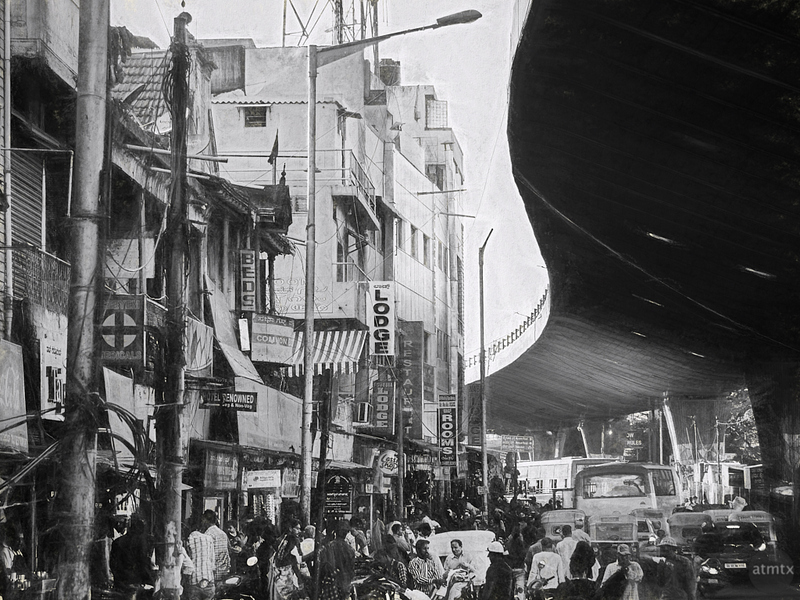 Of my photographs in and around KR Market, this might be my favorite. I framed this at a 108mm equivalent, which not only zooms into the details but also compresses the space between the stores and the highway. What I like most is the contrast of the old textured downtown with the stark minimalism of the modern highway and how it wraps around the cluster of buildings. The people and traffic just adds to the flavor and really shows the cacophony of the place. 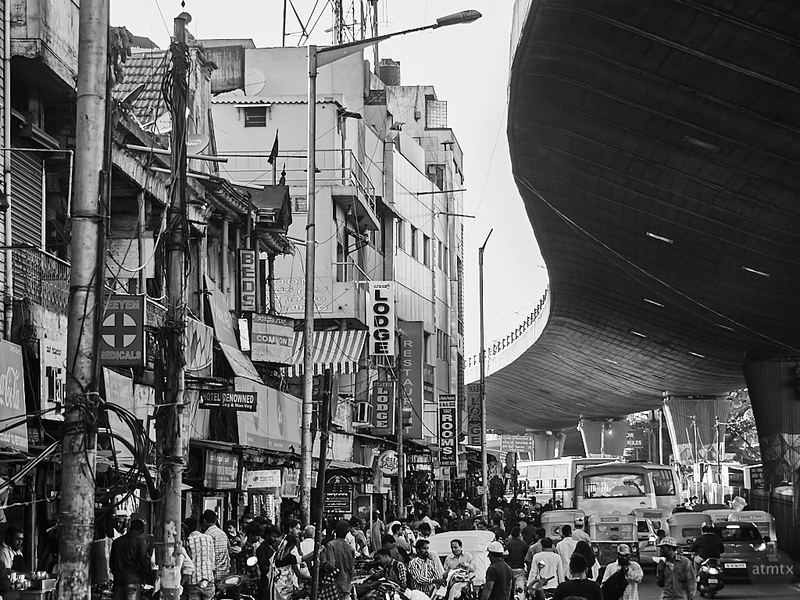 I’ve mentioned this eyesore of a highway in an older post, but in this photograph, it’s a foil which contrasts against the texture of old Bangalore. I made this second landscape, oriented in the vertical, from the same place as the first. Except, I used a 50mm equivalent lens shot with my other camera. Having two cameras allowed me to shoot these two compositions without switching lenses. I prefer the top photo but this second image also has its merits. Finally, I’ve experimented with my Art-ish images using Topaz Studio software. This time, the subtly textured black and white adds a bit of age and a digital patina. I’m considering making a larger print for display, but I’m not sure if I will use the standard black and white photograph or this Art-ish version.